For the past few decades, we haven’t been able to talk about global growth without mentioning China. Despite the recent slowdown, the Chinese economy remains the single largest contributor to world GDP growth. A new report by Deloitte Insights, however, says that China will soon be playing second fiddle to India as the biggest driver of global growth. The report, entitled Ageing Tigers, hidden dragons, argues that there is a “third wave” of economic growth in Asia. The first wave was led by Japan in the 1990s before China took over. But the Chinese-led second wave has already peaked, making way for a third wave driven by India. The third wave will be mostly driven by a massive increase in workers. Over the next decade, India’s working-age population will rise by 115 million. This is more than half of the 225 million expected across Asia as a whole. Within two decades, India’s potential workforce will rise to 1.08 billion. But it’s not just an increase in workers that will help propel the Indian economy. The new workers will be “much better trained and educated than the existing Indian workforce”, says Deloitte. Meanwhile, Japan’s working-age population will shrink by more than 5 million, and China’s by 21 million, over the next 10 years. In fact, India’s working population will soon outstrip China’s. 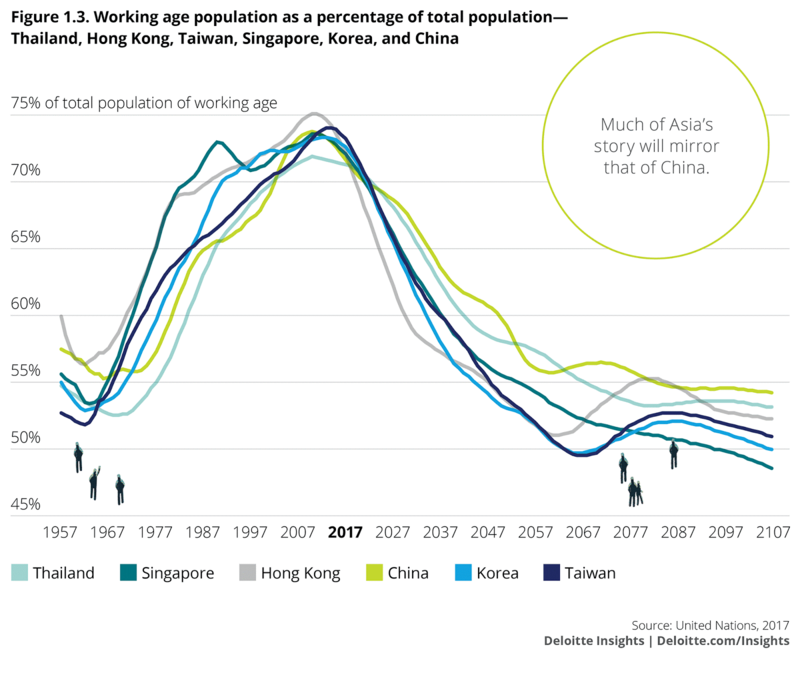 While China’s population is already ageing, this won’t happen in India until halfway through the century. 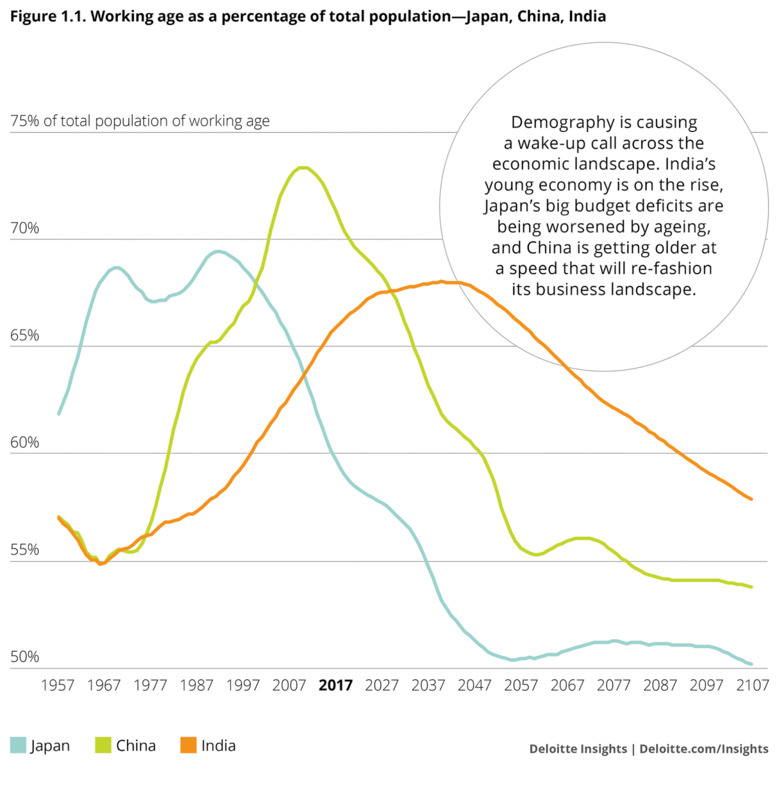 China’s ageing population will slow down its growth potential. While its one-child policy is no longer in force, the effects are still being felt. Soon, there will be fewer people of working age. Not only that, but because of the one-child policy, China’s population has aged faster than elsewhere. As a result, China won’t feel the full benefit of its years of economic growth. 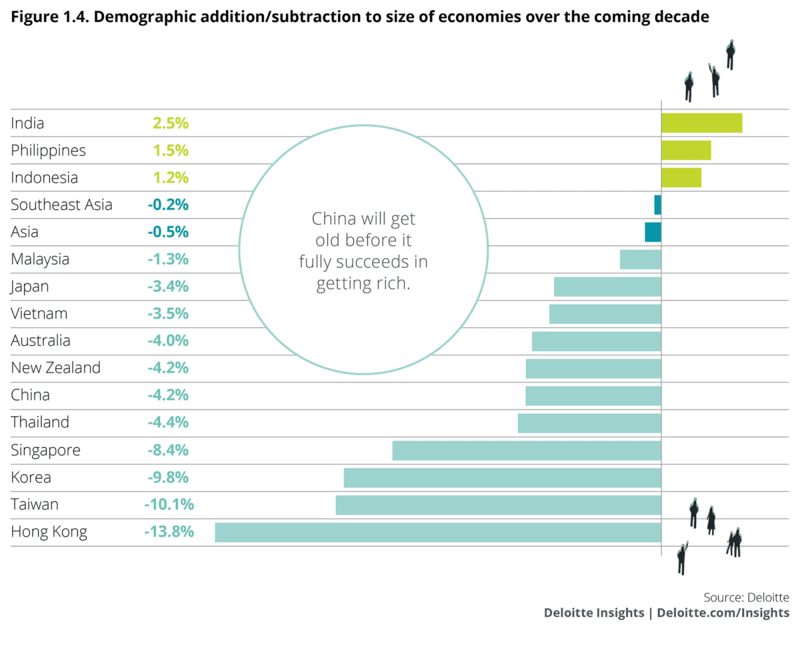 “This is yet to seep into the consciousness of most of the world, which still regards China simply as a country with an extremely large population,” states Deloitte. India won’t be the only Asian country to take over from China. Indonesia and the Philippines also have young populations. What this means is that the size of the economy in India, the Philippines and Indonesia will rise, while that of other Asian countries will decline. Countries that face this demographic decline have to support growth in other ways, says the report. This includes reforms that improve productivity – making workers more efficient – as well as being more open to migrants, and getting more women into the workforce. “The next 50 years will be an Indian summer that redraws the face of global economic power,” concludes the report. But it issues a word of warning. While rapid economic growth may be good news for India, a rising population could equally result in unemployment and social unrest. Getting richer isn’t guaranteed, says Deloitte.